Travelping partnered with wilhem.tel to design, implement and deploy the network services that enable free Internet access to all passengers of the “MetroBus Line 5” in Hamburg, Germany. This is the busiest bus line in Germany. It stretches 15 km and serves approximately 60000 passengers every day, according to data provided by its operator Hamburger HOCHBAHN. This is the largest deployment of mobile WiFi access points in public transport as the currently operational network on Line 5 is only the first step of the full rollout. The public unveiling of the service on 21 April 2016 attracted major media attention. 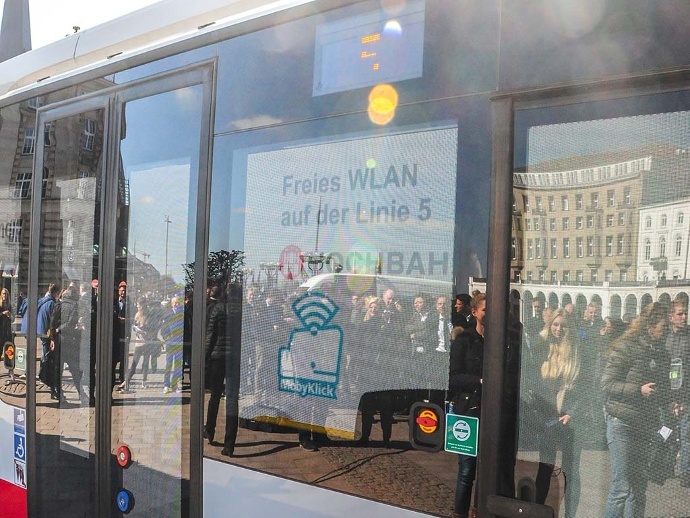 According to newspaper reports, free mobile WiFi Internet access is part and parcel of the overall HOCHBAHN digitalization strategy to increase the appeal of public transport. Travelping delivered carrier-grade network attachment and management for all distributed wireless access points on Line 5. In particular, Travelping provides carrier-grade CAPWAP WiFi with the same operational and management quality as 4G/LTE. Wilhelm.tel provides network and operations resources and leads the project. Travelping CEO Holger Winkelmann points out that “the project went from whiteboard designs to real-world rollout in two months only”. The company expertise in delivering carrier-grade solutions were key to such a fast rollout. Winkelmann emphasizes the importance of quality and speed of execution as well as adherence to high-quality standards. He favors deployments that are in line with international standards and best-practice industry solutions. Travelping develops and contributes to carrier-grade open-source software implementing standards such as CAPWAP and RADIUS.